Provide comfort for the family of David "Dave" Hohlfeld with a meaningful gesture of sympathy. 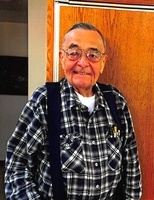 Derby - Hohlfeld, David, long time “Ham” radio operator W0KFS, passed away March 14, 2019. Dave was born to Walter and Gertie Stevens Hohlfeld in Clay Center, KS and resided at Greenleaf, KS, until after graduation. He went to college at K-State and received an Electrical Engineer Degree. David worked at Beach Aircraft before working and retiring from Boeing. He was a design engineer on the B52 electro-optical viewing system where he designed and tested printed circuit boards and black boxes that held those circuit cards. He developed test procedures and test programs for the Boeing. Later, he transitioned into the product support group, which includes technical publication, until retirement March 1992 with 21 years. He was lead Editor for 147 different maintenance manuals, including "General Aircraft" manuals, job guides & maintenance support manuals. When working for Beech the family moved to Boulder, CO for 6 months as he worked with 40 other Beech Engineers on the Apollo program "Lunar Excursion Module" program at the then Beech Aircraft Aerospace Development Facility at Boulder, CO. Dave was a long time collector of Amateur "Ham" radio equipment. He was a member of QCWA & Tech-ni-chat. He was one of only 3 people in KS, to get a Department of Defense Certificate of Merit in 1954, signed by the Secretary of State, Charles E. Wilson. He accomplished this by copying a document with intentional errors as sent, in 25wpm. David is survived by his wife of 28yrs, Sharon Cotton Hart Hohlfeld; sons, Dwight (Kristy) of Andover, and Kent of Portland, OR; 1 granddaughter, Sarah Hohlfeld. Visitation 1-8pm, family greeting 5-7pm Thurs. March 21st at Smith Mortuary - Derby, 1415 N. Rock Rd. Funeral 2pm Friday, March 22, at Cornerstone SDA Church, 903 S. 127th E. in Wichita (127th is closed at Kellogg). Memorials are with the Harry Hynes Memorial Hospice and the Cornerstone SDA Church Audio Dept. Keep in mind that Kellogg and 127th is blocked. We encourage you to share your most beloved memories of David "Dave" Hohlfeld here, so that the family and other loved ones can always see it. You can upload cherished photographs, or share your favorite stories, and can even comment on those shared by others.